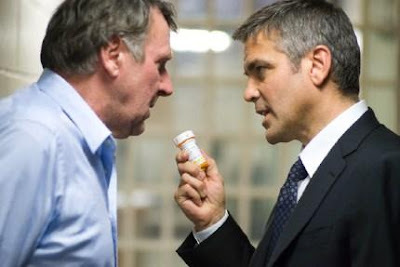 Getting a second theatrical release in time for the Oscars, MICHAEL CLAYTON (MC) is well worth the effort of getting out of your house and into your local movie theater. A gripping, intelligent thriller about what can happen when a killer shark lawyer grows a conscience, MC boasts one of George Clooney's most powerful performances to date, as well as a stark, sleek, stunning directorial debut for screenwriter Tony Gilroy. It's late at night, and everyone working at a major law firm in New York is there to settle some fundamental issues. Only one person is missing: he is somewhere else, handling another problem and then going back home. He stops on the way to look at the landscape and possibly think about what he has achieved. All of a sudden, his car blows up, leaving him alive by miracle. Such a prologue would suggest this is the latest spy movie, right? Wrong. We're talking about a legal drama, a slow-burning thriller that allows George Clooney to show his darker side again after his wounded, Oscar-winning turn in Syriana. The former ER star has always favored socially relevant pictures over blockbusters, using his earnings from crowd-pleasers like Ocean's Eleven or Spy Kids to make sure Good Night, and Good Luck, among others, got made. By his own admission, Ocean's Thirteen, which wasn't bad, was on his schedule just to grant Michael Clayton the financial backing it needed. Was it worth it? Yes. The man the title refers to, the guy Clooney portrays, is the same person whose car explodes. The film subsequently moves back in time, showing the events that led to the attempt on Clayton's life. It all has to do, apparently, with his peculiar job: Michael is a fixer, one who erases and constructs evidence, keeping clients out of jail and earning his boss Marty (Sydney Pollack) a load of cash. This time, he has been asked to take care of a fellow "garbage man", Arthur Edens (Tom Wilkinson): he was supposed to make sure everything went smoothly in an important case involving U/North, a chemical company, but all of a sudden he has taken the opposite side, starting to gather proof against U/North and behave bizarrely (stripping in public, for instance); this situation is a pain in the neck for Karen Crowder (Tilda Swinton), the company's legal adviser, and for Marty, neither of whom can afford to let this matter go awry. Enter Clayton, whose task is to talk some sense into Arthur and get things back on track. As the days pass, however, Michael gets increasingly concerned about his future, wondering whether what he has been doing so far is the right thing. The legal world is a messy one, something we already knew thanks to John Grisham (referenced in the casting of Pollack, who directed The Firm). 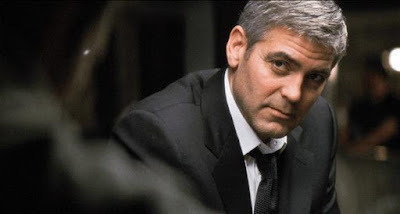 Michael Clayton, however, is not based on one of his works, but is the original creation of first-time director Tony Gilroy, who reportedly got the idea for the movie while doing research for his The Devil's Advocate screenplay. Given the quality of the latter, it's hard not to expect the same from Clayton. Alas, the great writer's lack of experience behind the camera shows in the first half-hour, as he struggles to find the right pace for his story: after the shocking introduction, the film proceeds quite slowly, offering tons of information and dialogue but little time to process the whole thing. Considering Gilroy wrote the breathless Jason Bourne movies, such stiffness is confusing. He also makes the mistake of giving his protagonist an excessively tragic background: one subplot about the guy's family is all right, three or four is taking it way too far. Once the explanatory bits are out of the way, though, the plot starts to flow more easily, allowing the characters to really interact instead of just sitting down and listening to some monologue about what's happening and why it's bad. Wilkinson, who has the most difficult role to play, delivers a competent performance, although no mention of his previous deeds makes his "redemption" a bit hard to swallow. Pollack, in a part he could do in his sleep (see his similar work in Changing Lanes), discards clichés and goes for a sincere, believable characterization. Outranking them both is Swinton, whose purely British depiction of subtle yet tormented evil finds its match only in Clooney's painful intensity: fearlessly playing Clayton as he is meant to be shown (a cynical, calculating scumbag with a serious gambling addiction), he sets aside his trademark charms and conveys real sadness, doubt and ambiguity. Only in one scene does he let his movie star persona emerge, and that he manages to do so without ruining the picture's tone confirms his status as one of the smartest actors working in Hollywood. There are many people out there who hate the way Paul Haggis made his directorial debut, "Crash," an overly soapy and stupidly-tied-together drama (at least, that's what it felt like to them). Those people don't have to worry. His second major directorial outing, "In the Valley of Elah," avoids both of the "mistakes" (although I'd hardly call them that, seeing as he won Best Picture for what he did with "Crash") that he made last time around. Instead of mixing together multiple stories and having them all connect at the very end, this movie revolves around one main story, a story that seems a lot like the modern-day war version of "Chinatown." Instead of going for simple emotional tugs that he did with "Crash," this film focuses on its understated performances, namely from Tommy Lee Jones, who is superb in this film. 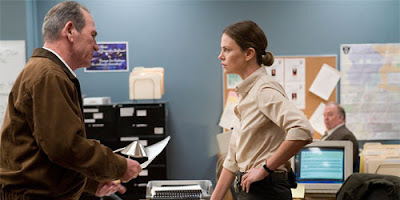 It is truly courageous of Paul Haggis to be willing to make some serious changes to the style that won him a Best Picture Academy Award, and even more impressive that he pulls it off very well. The story revolves around an ex-military officer, Hank Deerfield, who is told that his son, a soldier returning home from Iraq, has gone missing. Jones plays the character in such a quiet way that makes you feel like he thinks he shouldn't be showing emotion, but has a lot of it bottled up inside of him. When he arrives at the military station, people don't seem to want to tell him what happened, and say that they expect he'll come to the base anytime soon (this is portrayed especially well by James Franco, who you may know as Harry Osbourne from the "Spider-man" movies). Refusing to believe that it's as simple as that, Deerfield is relentless in getting information out of people as to what really happened. It's the way he functioned in the army, and it benefits him greatly as he has to get any information he can out of people. Enter Detective Emily Sanders (played by a very strong Charlize Theron), who at first just wants to get through her job for the day, but soon gets wrapped up in also discovering what really happened to Deerfield's son. The two of them have great chemistry together, as their two different personalities give two different perspectives on what's happening. The movie works because although it does have quite a few negative things to say about the current war in Iraq, the entire film isn't a two-hour tirade against it. It only makes that message part of the story, and does it in subtle ways (aka the soldiers don't just go "War...it...destroys...you..." but take a lot more time expressing their emotion). Much of the story works like a mixture between the great film "Chinatown" and a much better-acted, better-written version of a really good episode of "CSI." Although there may be a few too many twists and lies circling about, it comes to its conclusion very well in a satisfying way for the audience. Paul Haggis has an uncanny way of bringing out great performances from all of his actors. The performance of Tommy Lee Jones could be the best of his career, he brings out a much more emotionally quiet side in Charlize Theron than we've before seen, the short performance of Susan Sarandon is particularly powerful, and all of the soldiers are played with a feeling of sincerity. The acting is probably the strongest element of the film, and if there's any "weak part," it would have to be the way Haggis forced out some of the plot twists to make the film as long as he wanted it to be. Regardless of its few problems, "In the Valley of Elah" is both a very well-mannered look at the war in Iraq and its effects on the people involved, as well as a very interesting crime thriller. At the heart of it is Haggis's quietly powerful directing style and the cast's powerfully quiet performances. I don't see this picking up a Best Picture nomination as Haggis's past three Oscar hopeful screenplays ("Letters from Iwo Jima," "Crash," and "Million Dollar Baby"), but I would not be surprised to see it pick up a few acting nominations as well as possibly a screenplay nod. If it does...it would have definitely earned it.